So we’re now 48 days into our daily decluttering experiment! Woo! I get a high every time I throw something into that donation box! Haha… And I keep finding stuff too, despite being a practicing minimalist. #1. Lots of unwanted stuff is hidden in drawers and cabinets! It’s easy to sort through the stuff you can see in plain site, but to REALLY find the hard stuff you gotta look in all the nooks and crannies of your house. Particularly drawers and cabinets and any other containers where things can easily hide. We’re good at forgetting about the stuff we can’t see! The biggest areas for me here were a box of old laptops and cell phones (so much data on them, couldn’t just throw out for any ol’ hacker to find, right?? ), as well as decades old, and valuable, jewelry we no longer wear anymore. But by focusing on just *one* of these items each and every day, I was able to get through every last one of them and even LEARNED something in the process! 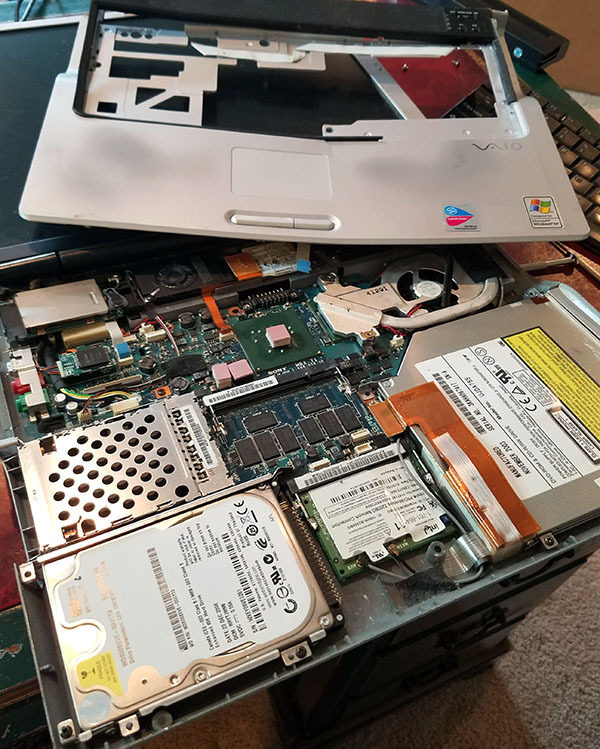 Like that you can take laptops apart and pluck out their hearts (hard drives) and then connect them to a chord thingie to retrieve all your lost files! And then more importantly, *wipe them all clean* so you can finally ditch them! #3. The more valuable an item is, the harder it is to get rid of! Probably not be the best plan for getting rid of valuables, especially if they’re SUPER valuable and/or you really need the money, but it did the trick for me and just like that they were off of my mind and out of my house! #5. Lastly, sometimes you need multiple rounds of decluttering to finally take action on your stuff. This is the part I feel like most people overlook in their minimalist journeys. The impression you get when you read about this stuff is that you should be able to look at something you own, and then make a decision right away and move right along to the next item. But the reality is that not everything is so black and white, and sometimes it takes a *few* rounds – or even years! – to finally be comfortable making a call on something. So don’t get too hard on yourself if there are a few items here and there you’re struggling with – it’s normal! And perhaps the next round or two will give you the insight you were hoping for. So needless to say, this has been another eye opening experiment for me this month! And exactly why I keep doing so many around here – YOU CONSTANTLY KEEP LEARNING ABOUT YOURSELF!! Which all infiltrates back to your daily habits and spending and accumulating, and so on and so forth. It’s a magical thing :) And one I hope you’ll give a shot too! A good smattering across the board! With again, the hardest being the computers and related items, along with the stash of jewelry. Feels so much FREER finally tackling them all! But I was successful in retrieving what I needed!!! 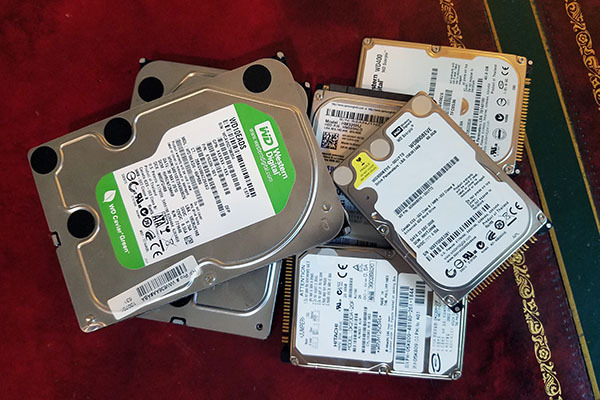 Here are all the hearts (hard drives) – aren’t they pretty?? From there, it was moving on to figuring out just *how* to get all the files off these guys so I could finally ditch everything once and for all. 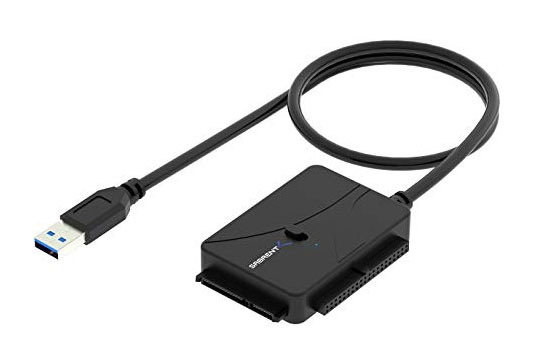 And to do that (after some quick Googling), I had to purchase this bad boy which directly connected them right up to my (working) laptop via USB port. So easy!! Of course, it would have been much easier downloading everything and wiping the computers clean when I FIRST STOPPED USING THEM!, but hey – sometimes you don’t feel like doing that when you’ve got a shiny new one to play with :) Plus, half the time they crash on you anyways not even giving you that chance! So all in all I was pretty pleased with myself here as a non-techy. So let me know! And if you’ve missed any of our previous experiment recaps lately, here they are again below… Try any of these out and your wallet/life is bound to be happier! Wow, it’s like a computer time-capsule! I have some old hard drives to get rid of too, thanks for reminding me to get on it! You’re gonna have a lot of fun sorting through all those old files! I actually have all my old files on one drive. Sort of. Every time I upgraded, I copied the old files to the new drive, but there are duplicates, upon duplicates, upon duplicates. I’ve started going through them and have deleted gigs of duplicates and stuff I don’t need. But I have found old college emails that are cool. And a backup I had of someone ELSE’s computer, that has crashed, and I’m the only backup. So pack-rat for the win in that case. It’s definitely a work in progress, and a long term project. That would be cool seeing old college emails!! Oh shoot… I deserve to be slapped. I forgot to do it completely. I think I even said it was going to be easy…..big d’oh!!! It’s been 45 days already?! Time to add it into our daily to-do alarm! I have a couple of old laptops that I need to dispose of. I was thinking of just hammering them to bits since they’re about ten years old and I doubt they’re useful to anyone. Looking at those pics and the work you did makes me think my idea is the way to go. You’ve also given me the motivation to tackle a couple of closets that are filled with who knows what. Haha good – maybe you’ll find something valuable you can sell! RE: Hammering – that was my first thought, until I challenged myself to try and see if I can figure out how to pull them a part first – which I’m really glad I did because it turned out to be fun! But when I was done playing with them all, I did bang them around a bit and then dump them into a bucket of water and soap (hah! ), just to be quite certain nothing was operational anymore :) I know you can donate old computers that get refurbished an re-used again, but still makes me nervous. And to your point about *old* computers, no one would want/use those much anyways. Thanks for the tip about the batteries. I didn’t realize that Best Buy will recycle them. 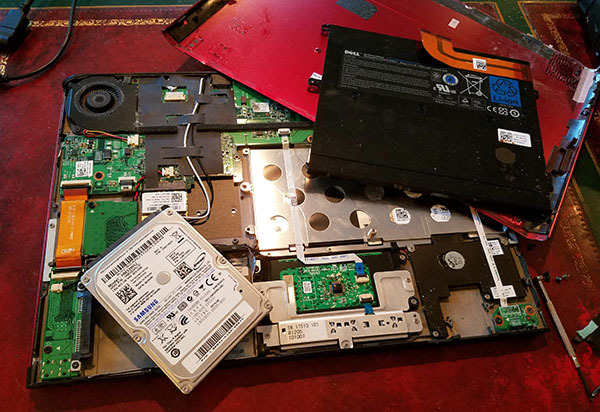 FYI, if you’re lazy like me, Best Buy will take the hard drive out of your computer while you wait, give them back to you and then recycle the computer. I’ve got some old computers in my closet I need to get rid of. Was hesitant to do it a long time ago in case I need something from one of them, but I never need anything from them. Your story about the keyboards reminds my of my daughter. I have an old laptop that she uses to “work” at a small table in my office sometimes. It’s small things like that that make working at home a really awesome privilege. I haven’t done very well pitching “one thing a day” but I have been more mindful of clearing out old, unused stuff when I come across it. In the next couple of weeks, I hope to hit a home run as I have been refinishing my kitchen cabinets & am totaling reorganizing them before rehanging the beautiful new doors. Just yesterday, I got rid of: mini strainer (duplicate), half jar of molasses; old spices; casserole trivet and an old water bottle. There you go! Every last item feels good! I totally understand the high you get when getting rid of an item. We did some purging in our garage a few weeks ago and I felt a real sense of accomplishment as I carried the garbage bags outside. Now the key is not to replace all that stuff with newer stuff!! I didn’t do the daily challenge. However, my wife and I have been on a decluttering mission for the last few months. We got rid of two bookshelves of books, cleaned out closets, and got rid of stuff we weren’t using. She sold most of it on the Facebook Marketplace (where she’s been promoted to a top seller. To date, she’s made over $3,000. The old adage of one person’s junk is another’s treasure holds true. She stays away from Craigslist. Says the buyers are less serious and more of a pain. Uncluttering is ongoing, but slows down after a person/couple becomes minimalists. We are retired and he spent 20 yrs in military, so we were minimalists before it became popular. Had to move around lived in furnished rentals. Knowing kids create more clutter (furniture, clothes, other stuff) we chose to be child free. Being oldest of four (kids didn’t have much back in the ’60’s), as time went on, I saw then that older kids are worse for clutter more clothes, gadgets, school stuff, sporting equip, etc. 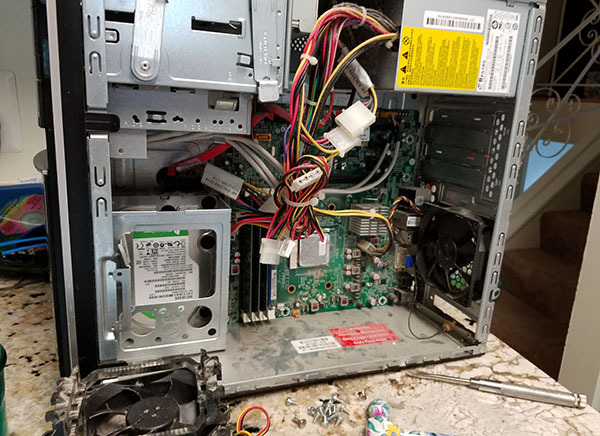 I have a computer that I need to get rid of. I need to take the time to either remove the hard drive or reformat it. Reformating would be easier but once the computer comes on, I can’t even get it to move past the home screen. Exactly why you need that cord! You just plop that sucker out of there, and then connect it on up and can both download all the files AND reformat once you’re done! Super easy, and I’m no where close to being a tech guy. I struggle with getting rid of the kids old art! Any tips? Its hanging everywhere and have a huge bin of old ones just continuing to pile up but feel bad throwing it away! Use them to wrap gifts for birthdays/holidays. Still going strong over here, accomplished my 30 days and like you I ain’t stopping. I’m still get rid of the easier items and haven’t had to face the harder things quite yet, but I know that day will come. Love the list and I think Dr. J$ has a nice ring to it! What I learned was it feels great to help someone out who has a positive attitude and is thankful on a beautiful Sunday. Man I thought I was fairly minimal until I started having a lot of trouble with this challenge, haha. I want to get rid of things, but I think I’m getting stuck on the “how to accomplish it best” bit. I think I need to take your “done is better than perfect” route and just drop it all off at a local donation center. Great inspiration. I’ll keep at it. Never used volleyball??!?! Blasphemy! lol! With this move, I’m finding so many things, like little parts or plastic thing-a-ma-jigs, that I have no idea what they are for! I find that stuff to be an irritation. It’s funny because I considered myself to be pretty minimalistic, but I’m finding a lot has lurked behind drawers and closets. I got some old laptops sitting around because I don’t know what to do with the hard drives. I gotta give this a try myself so I can finally take them to recycling. Same with a old smartphone. I used to hate the idea of challenges, but this one is great. I had a rummage sale this weekend and blew out a bunch of stuff I didn’t want anymore. The feeling was awesome. I’m in on your daily challenge to get rid of stuff. I’m not a hardline minimalist, but I hate junk lying around. I donate or give to friends all the books I read. I don’t see the point in keeping books, except for a few cookbooks or self-help type books that I reference regularly. I really need to to better with clothes though. I did a huge purge of lots of things when we moved int our current house because it is half the size of our last house, but since then I have been back in the accumulating phase. Hi Patrice, try capsule wardrobes. Use Less vlogs on YouTube are so addictive. I’ve been informally doing this too! Super happy to have scheduled a big donation pick up for this morning. I’m trying to sell and recycle and find new homes for things as much as possible to reduce the hit on the environment while I’m minimizing and decluttering. What did you do with those CDs? I have a stack behind my desk right now waiting for me to figure out how to dispose of them safely and without damaging the environment too much. CDs – I just cut them in half and then trashed them :( Never heard of anyone recycling those but I’ve also never researched? I was told that CD’s and DVD’s are hazardous waste. I donate music and movie items to local libraries so they can resell to raise funds for library. Other items old recorded disks are accepted at hazardous waste drop off along with old electronics. Oh wow – never knew that!! Great idea w/ the library donating! Decluttering is my love language! I think kids attract clutter too, no matter how well you stay on top of it. I’m going to be doing a huge purge here when I switch out my daughter’s wardrobe to her fall stuff. Good job, J $! 2 days ago our county had an eletronics recycling day and we got rid of 2 boxes of dead junk! It felt so good, but afterwards realized 2 things we had missed (one being a giant printer in the furnace room). I’ve been wondering where we were in the 30 day challenge – lost track of time! 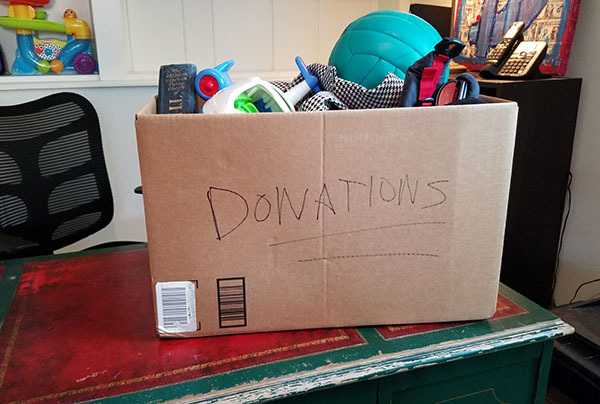 I’ve got multiple piles that need to go to their next home – goodwill, humane society (old towels and blankets) and food bank (need to stop stocking up on items just because they are on sale – it’s no saving if you have too many and you will never go through it all). Plan for the weekend is to make my “deliveries”. I try to keep stuff/junk out of my house put had no struggle to find more things to part with! Well that’s good! Means you should be able to continue this challenge no problem then :) A trick I use for the “getting it out of the house” part is to just push things into the trunk of my car, that way a) they’re physically out of my house, but b) when I’m out and about and remember I have things to donate, everything’s already with me! So no extra trips or having to remember again! The aquarium CD is my favorite item on this list, that’s hilarious! This was a great read and I really enjoyed your takeaways. I’m still removing items nearly daily without trying, and it’s made me think twice before bringing new items home. Glad you liked it, haha…I can’t believe I still had that thing!! I am loving this challenge. The only problem is that I keep forgetting about it and having to play catch up when I remember. I don’t want to be the smartass here. But come on, you could not say this seriously that you think that hammering your laptops is a good idea for recycling and/or protecting your data. 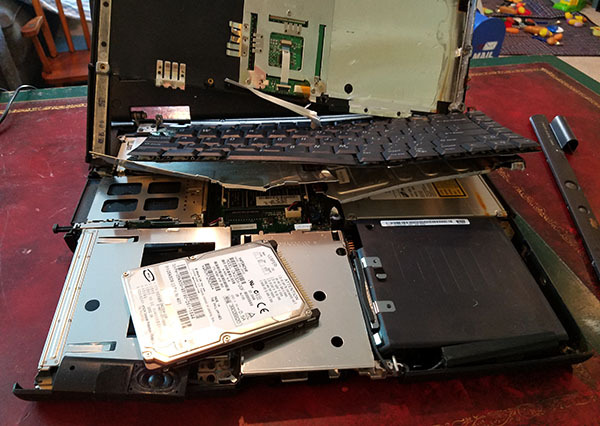 You should not afraid of a security leak, no other parts than hard drives will keep your sensitive files so it is enough to remove those and you can recycle the rest at the closest place with a peace of mind. Someone somewhere may use them or get the material out of it and produce new machines from it. Win-win. Another easy disposal method is to drill holes into the hard drive platter area. Find the circle on the top 2/3 of the drive and drill a few holes around it. Rather than just formatting the drives you should run something like DBAN on them. A lot of the time you can fairly easily recover files from a drive that has been formatted. Yup, future rounds will make it easier on some of those items for sure. We slowly improve every time we review things! Reformatting a hard drive does make it unreadable for most regular computer users. 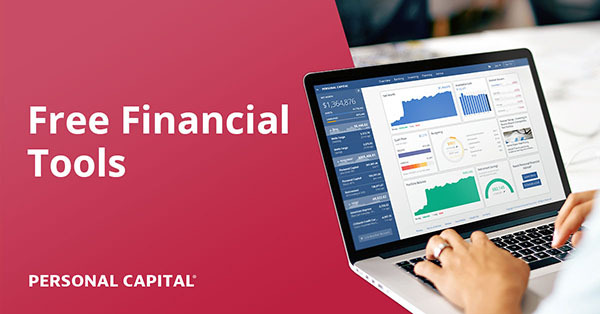 However, it is still possible to get a great deal of the data from the hard drive if you have knowledge of the storage algorithms used by operating systems. Reformatting removes the links and indexes the operating system uses to access the data, but the data is still there. To remove the data, you need to actually “blank out” the data – using a “de-Gausser” device which sets the device to a null magnetic state (all “zeros”, not the original pattern of zeros and ones encoding your data). Law enforcement (and criminals) as well as legitimate computer service technicians can do this to recover data. Would immersing them into water and soap do anything to render them useless, or would you still be able to access files if you’re a pro? Congrats on continuing the experiment for 48 days, J. Money! I only did it for 30 days and got rid of a lot of little things, for the most part. I do have a donation bag that needs to be taken to a thrift store, so thanks for that. I would def like to do this again before the year is out. I’m somewhat distracted right now by several financial issues, including finding a new job and adjusting to fewer hours at work. I’ve been doing a version of this all year after reading Cait Flanders’s “The Year of Less” in January. In August, I got rid of 200+ items (trashed, sold, or donated). Mostly clothing items, books, some smaller furniture pieces, framed artwork, jewelry, kitchenware, household items… the list goes on. I still have TONS to do and go through, but I feel a little lighter & more organized every day. On to September! I emptied a storage bin full of the clothes that I was going to wear (WHEN I LOST WEIGHT). My sticking point was…. since I purchase most of my clothes off season, some were new. But after going through the bin & trying on every piece (what a waste of time)! I knew it was time to make someone else’s day. I put all the clothes on the $2.00 table & donated the money to the charity running the yard sale. Next project, DVD’s I haven’t seen for 10 years. This is an interesting idea. Getting rid of things sounds simple but practically hard to accomplish the idea. Going step by step can really help. It takes a lot of determination though. This is a fun read. Thanks for sharing. My husband and I tried this challenge and kept it going for 64 days! It’s a~mazing how much useless crap we dug out once we put our minds to it. It’s really taught us not to buy things on impulse, either. A lot of the stuff we threw out / gave away / sold was bought on impulse and hardly used, if ever. Great idea, thanks for sharing! Next post: Some Q&A’s: Retiring, Resting, Investing, Coin Collecting!